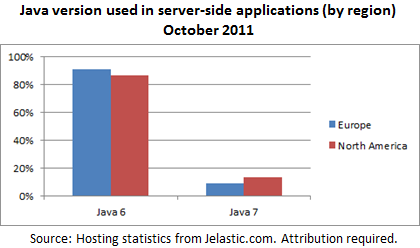 In Jelastic Java PaaS developers can choose whether they want to use Java 6 or Java 7 on their application servers. Now that Java 7 has been out for a few months and available in Jelastic since early September, we thought we would take a look at penetration of Java 7 compared to Java 6 within the environments. 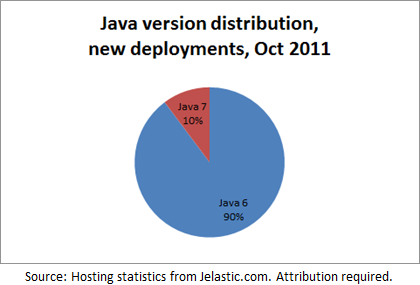 This might be due to the fact that Jelastic launched in the US later than in Europe – so the higher Java 7 use might simply demonstrate that Java 7 adoption is growing. We will keep posting these updates on a monthly basis so you can track the dynamics of Java 7 adoption.